Live at Medina Temple, Chicago, June 1, 1956. It can sometimes be difficult to always love every aspect of Louis Armstrong. By 1956 he was an entertainer par excellence. 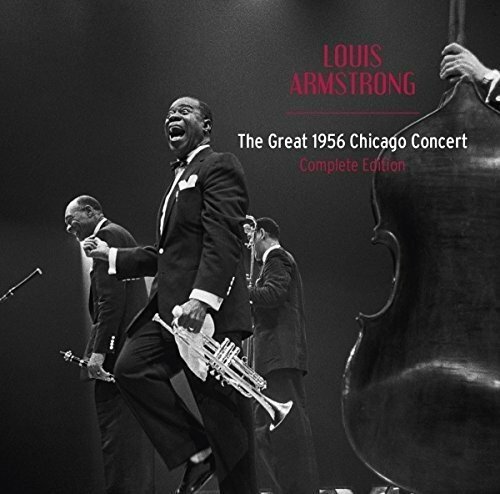 The All Stars travelled the world and Armstrong delighted audiences with his humour, his bonhomie, his singing and often his trumpet playing. His stage persona and his willingness to ‘entertain’ were at odds with jazz musicians who, increasingly, were taking themselves very seriously. The All Stars concerts could become variety shows. This is not the best recorded available concert. The idea at Columbia was to have Armstrong play music that illustrated fifty years of jazz history with an actor doing some linking narration. George Avakian also expected Louis to play some new music. He decided to record the event but found that Columbia’s unit was due to record the Philadelphia Orchestra. Avakian then had to rely on audio engineers from the local Columbia radio station who assured him they had the expertise to do live recordings. Avakian was not pleased with the results of the recording and the lack of new pieces so the concert was not released until 1980. At times Louis is off mic; that is particularly apparent in ‘West End Blues’ where his first chorus was recorded at a distance. Edmond Hall wanders round the stage. Nevertheless, there are some splendid moments during the concert particularly from Armstrong. This was not the best version of the All Stars: Trummy Young is inferior to Jack Teagarden, Edmond Hall is no Barney Bigard, Billy Kyle is no Earl Hines. These musicians are quite happy to take a back seat to the main attraction of Armstrong. In some ways this is a parallel to the career of Miles Davis. As so often happens with horn players the embouchure deteriorates and they are forced into other strategies, in Armstrong’s case singing. Miles spent his last ten years seeking greater public acceptance surrounded by musicians who were inferior to those he played in the past. Armstrong's trumpet playing at this time was still wonderful; the unique tone and the vivacity were splendid. Armstrong's performance, however, does not hide the fact that this is a routine evening with the All Stars, the kind of event that you could, at that time, have heard all over the world. It is great to have but the fact remains that there are better, much better concerts by the All Stars. Producer George Avakian around this time inspired Louis to produce two wonderful albums: ‘Satch Plays W.C. Handy’ (1954) and ‘Satch Plays Fats’ (1955). The discipline of the studio is absent here. The evening starts with the band marching up to the stage playing funeral style ‘Flee as a Bird To The Mountain’ and ‘Oh, Didn’t He Ramble’. ‘Black and Blue’, by Fats Waller which follows is probably the most satisfying piece on the album capturing, as it does, the resigned protest. The old favourites, ‘Mack The Knife’, ‘The Saints’, ‘Rockin' Chair’, are all there and though he has performed them many times before they are imbued with freshness and zest. Armstrong’s singing with its humour and superb timing is evident throughout. Velma Middleton belts out her three tunes. The rhythm section of Kyle, Deems and bass player Dale Jones support well. The package includes a 20 page booklet. If you have never heard Armstrong live, and increasingly few have, this is what it was like in the fifties.